Rotary storage cabinets are great for offices. They store supplies, files, boxes, binders, and everything else you keep on-hand. The cabinets spin 360 degrees to give you double sided access and capacity. Plus they lock up tight when they aren’t in use, making them an excellent solution for confidential files or sensitive computer media. But rotary storage cabinets are good for more than just offices. Here are three new applications for rotary cabinets that you probably didn’t know about. 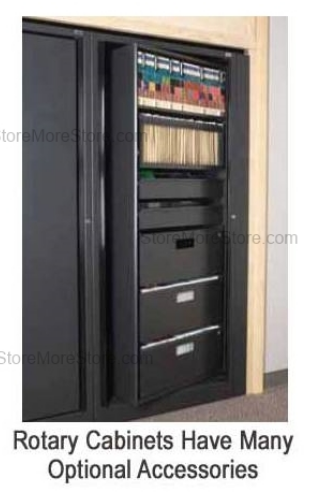 That’s right, rotary storage cabinets are an excellent solution for storing museum collection items. With a variety of accessories including drawers, a wardrobe kit, and shelves, you can store just about anything. Have some slides you need stored? Keep them in one of the drawers. Have articles of clothing that need to be preserved? Hang them up! And you can be sure that your collections will remain safe and sound in the cabinets since the powder coated pain doesn’t contain any volatile organic compounds. Has organization and theft become a problem in your warehouse or auto shop? It won’t be any more with rotary storage cabinets. Because you can add bins to the cabinet shelves, you can ensure all your small parts and tools stay right where they’re supposed to be. And with a special keypad lock, you can prevent unauthorized access. 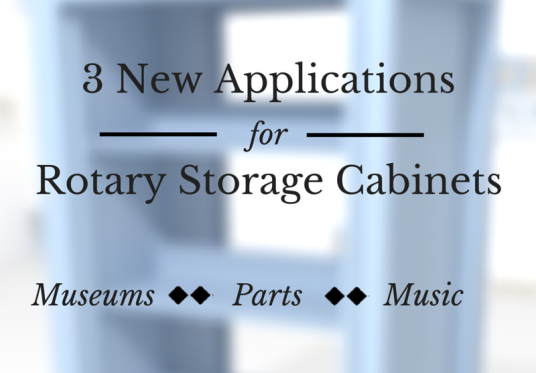 Another application for rotary storage cabinets is your music room. Churches, universities, and K-12 schools practice the art of music. But, that means you have a lot of sheet music, small instruments, confidential student files, lesson plans and other items that need to be stored – but not just anywhere, you need them to be stored in a secure location. This makes the rotary cabinet the ideal solution. Whether you’re using them for your office, museum, warehouse, or music room, rotary storage cabinets are a very versatile solution. So if you’re ready to ditch your outdated storage system, shop for rotary storage cabinets online from us! And if you have any questions or need help, give us a call at 1-855-786-7667.